For the educational institution in Tagbilaran, Bohol, Philippines, see Holy Name University. Holy Names University is a private, Roman Catholic university in Oakland, California. It was founded by and remains affiliated with the Sisters of the Holy Names of Jesus and Mary. The university was originally established as the Convent of Our Lady of the Sacred Heart in 1868 by six members of the Sisters of the Holy Names, a teaching order from Quebec, Canada. They were invited to Oakland by Father Michael King, pastor of Saint Mary's Church to establish a school for girls and to provide means to train future teachers. The original site of the convent was on the shores of Lake Merritt. By 1908 the convent began to offer classes at a post-secondary level and was renamed the College of the Holy Names. In 1949 the college became one of the charter members of the Western Association of Schools and Colleges (WASC). The coeducation graduate division was formally established in 1955. Soon afterward in 1957, the original site was purchased by Henry J. Kaiser where he constructed the Kaiser Building, and the school moved to its present location in the Oakland Hills. In 1971, Holy Names became coeducational at the undergraduate level and was renamed Holy Names College. The Julia Morgan School for Girls held classes for its first two years, from 1999 through 2001, at Holy Names. The school took its present name on May 10, 2004 and became known as the "newest Catholic university in California." Holy Names University is located on a wooded, sixty-acre site in the Oakland Hills about 2.5 miles southeast of the Montclair district. To the north of campus lies the neighborhood of Woodminster, and the City of Oakland's 500 acre Joaquin Miller Park. To the southeast, Holy Names' campus is flanked with the Crestmont neighborhood to the east, and the Redwood Heights neighborhood is to the west across the Warren Freeway. Redwood Regional Park, part of the East Bay Regional Park District, lies about 2.2 miles east on Redwood Road. San Francisco Bay Area architect Milton T. Pflueger, younger brother of the renowned architect Timothy L. Pflueger, designed the mid-century modern campus buildings, which were constructed from 1955-1958, and dedicated in 1957. Milton Pflueger designed many campus buildings at University of California, Berkeley and Stanford University, but Holy Names is the only complete campus he designed. The first buildings constructed included Michael and Maureen Hester Administration, the Paul J. Cushing Library, the Tobin Gymnasium, and McLean Chapel. The hillside location inspired a linear plan, with low-roofed buildings nestled along the slope. The site features panoramic views across the San Francisco Bay from San Jose on the San Francisco Peninsula to Mount Tamalpais on the Marin Peninsula. The Valley Center for the Performing Arts was constructed in 1994, in the former location of the tennis courts. It houses two separate theatres; large audiences up to 390 can be accommodated in the Regents’ Theatre, while smaller groups use the Studio Theatre with movable seating for up to 125 participants. HNU maintains small class sizes, with a student to faculty ratio of 13:1, and 90 percent of the faculty hold the highest degree in their fields. In 2006, for the third year in a row, US News and World Report rated Holy Names University a "best value" among universities that do not offer doctorates on the West Coast. Fifty-one percent of the incoming freshmen in the fall of 2006 were first generation college students and the student body represents 36 nations. U.S. News and World Report also ranked HNU as the most diverse university in the West in 2013. This same year, Holy Names University earned the highest diversity index score of all the colleges and universities included in the magazine’s multiple diversity rankings. The university offers nineteen undergraduate degree programs, and five adult degree completion programs. HNU offers seven master's degree programs in addition to a teacher education program leading to a California teacher's credential. Graduate degrees offered include several business degree concentrations (MBA with concentrations in energy and environment, finance, management and leadership, marketing, or sports management), counseling psychology (MA), education (EdD and credentials), English (MA), music (MA), and nursing (MSN/MBA, MSN). The university added a Master of Arts in Forensic Psychology in 2006. The Paul J. Cushing Library is a two-story facility with a distinctive vaulted ceiling and exceptional daylight on the main level. Its architectural design mirrors the campus chapel. The library provides the Holy Names community a full suite of electronic and traditional books and journals, as well as a wide range of gadgets and devices faculty and staff can check out. Library team members offer instruction to every department. The library regularly offers special events such as art exhibits, book talks, film showings, and lunchtime piano recitals. A popular spot for studying, the library averages more than 6,000 walk-ins per month. Women's Sports: Basketball, Cross Country, Golf, Soccer, Softball, Tennis, Track, and Volleyball. Men's Sports: Baseball, Basketball, Cross Country, Golf, Soccer, Tennis, and Track. Men's volleyball is offered as a club sport. The Center for Social Justice and Civic Engagement (CSJCE) includes Service-Learning and Community-Based Leadership (CBL) programs. The CSJCE offers numerous volunteer opportunities, service projects, and dialogues through its CBL initiatives. The Holy Names University Early Admit Program (HNUEAP) is offered through the Center. The CSJCE serves as an exemplary example of a strong partnership between academic and student affairs. Through its programs and services, the CSJCE promotes leadership development for social responsibility and cultural competence. Programs and services emphasize personal and social awareness, equity and equality, justice, diversity, service, community involvement, and social activism. Students are introduced to issues such as water rights, poverty, and education for the poor, all platforms pursued by the SNJMs. Belo Cipriani, author of Blind: A Memoir; Cipriani was also Holy Names University's 2012–2014 writer-in-residence. Masayoshi Son, Korean-Japanese businessman and the founder and current chief executive officer of SoftBank, the chief executive officer of SoftBank Mobile, and current chairman of Sprint Corporation. ^ As of June 30, 2016. "990 tax form, schedule D" (PDF). January 17, 2016. p. 2. Retrieved July 26, 2018. ^ "Alumni and Sisters present a plaque to A.B. Ordway, 1957". Flickr.com. Retrieved 19 March 2017. ^ "Julia Morgan School Julia Morgan School for Girls - All Girls Middle School in Oakland CA". Juliamorganschool.org. Retrieved 19 March 2017. ^ "Google Maps". Maps.google.com. Retrieved 19 March 2017. ^ a b Dinkelspiel Cerny, Susan (2007). An Architectural Guidebook to San Francisco and the Bay Area. Gibbs Smith. ISBN 1-58685-432-1. ^ a b c d Pflueger, Milton; John Pflueger (1986). Time and Tim Remembered. Pflueger Architects. ISBN 0-9614133-0-1. ^ "Hosts - Oakland Mayoral Candidates Forum 2010 at HNU". web.archive.org. 3 May 2012. Retrieved 1 January 2019. 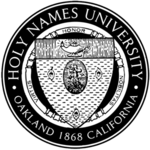 ^ "HNU at a Glance - Holy Names University in Oakland, California". Hnu.edu. Retrieved 19 March 2017. ^ "Campus Ethnic Diversity - Rankings - Top Regional Universities (West) - US News". web.archive.org. 26 January 2012. Retrieved 1 January 2019. ^ "Holy Names University - Undergraduate Programs". Hnu.edu. Retrieved 14 November 2017. ^ "Holy Names University - Graduate Programs". Hnu.edu. Retrieved 14 November 2017. ^ "Multiple Subject Credentials - Holy Names University in Oakland, California". Hnu.edu. Retrieved 19 March 2017. ^ "Master of Business Administration (MBA) - Holy Names University in Oakland, California". Hnu.edu. Retrieved 19 March 2017. ^ "Graduate Programs". Hnu.edu. Retrieved 2011-01-12. ^ Holy Names University Master of Arts in Forensic Psychology In 2014, HNU will offer a RN-MSN program. ^ "Holy Names University advances to active membership status for NCAA Division II". Hnuhawks.com. Retrieved 19 March 2017. ^ "UK Parliament - Alphabetical List of Members". 12 December 2008. Archived from the original on 12 December 2008. Retrieved 14 November 2017. ^ "The Winkler Group Team". Thewinklergroup.com. Retrieved 14 November 2017. This page was last edited on 21 March 2019, at 20:51 (UTC).